Many people think socialism is an extreme philosophy. It speaks volumes about the rottenness of capitalist society that ideas of equality, of organising and democratically controlling the economy to eliminate poverty, and to remove the sources of exploitation and oppression, are considered radical. Compare our ideas to those who seek to defend capitalism. What is justifiable about their world view? Capitalism is about the tiny minority who own or control large amounts of capital – CEOs, bankers, billionaires – increasing their capital by making profits. And there are profits to be made from war, destroying the planet, driving down wages, and backing the repressive regimes that let corporations do such things. Capitalism today is rapidly creating an environmental disaster that may ultimately threaten the viability of life on this earth. The scientific community has been reporting for decades about the threat of climate change. Yet the governments of the world have failed to reduce carbon emissions. The fossil fuel energy sector is one of the world’s most profitable. As energy demand increases, energy prices and profits increase. Ruling classes are not willing to give up these profits and write-off the trillions of dollars they have invested in this sector - the planet and its people be damned! Even if the resulting floods and bushfires do not claim your life, if you live in Gaza, Iraq or Afghanistan, war might. War is an essential part of capitalist business. Not only because the arms industry is profitable, but because the richer nations on earth are competing for influence, resources and markets for their goods. The major corporations of large powers like the US rely on their state to secure access to natural resources like oil, to pry open access to markets for their goods, and to ensure "stability" so they can continue to control strategic regions or to exploit cheap labour. The US’s status as the richest and most powerful nation was not achieved or maintained through peaceful means. T he US has militarily attacked or invaded more countries since World War II than any other nation in world history in a comparable timeframe. Capitalism also involves economic violence. There is an ever-widening gulf between rich and poor. Decade after decade, poverty figures from the third world get worse. 880 million children lived in poverty in 1996; by 2006 the figure had topped 1 billion. So much for the idea of a “trickle-down effect” where letting the rich enrich themselves further on the free market will result in wealth filtering down to rest of us! At the beginning of 2011, global food prices reached an all-time high. The market is now pricing more people out of basic nutrients than ever before. The food crisis (which is not caused by an inability to produce food, but rather by market forces) has now helped to provoke a wave of revolutionary strikes and protests in Tunisia and Egypt. This confirms what socialists have long argued: that the crises and deprivations of the system will ultimately provoke powerful mass movements of workers and the oppressed. Importantly, the process of increasing wealth disparity has been occurring in the richer nations as well. So in the US, real median incomes for working age families fell by over 8 per cent between 2000 and 2009. Even as the Great Recession continued unabated, executive payouts for Wall Street bankers reached a record level $US135 billion last year. The ruling class views the current economic crisis as an opportunity to accelerate their class war on workers. So at the behest of the Internaional Monetary Fund and European Union, the Greek government eliminated the 13th and 14th month annual bonus to public sector workers, plus cut their pay by 7–11 per cent, raised taxes and cut pensions by 55 per cent! Austerity measures – cuts to public spending – are occurring throughout Europe and North America. Socialists have always recognised that you cannot understand capitalism at all unless you first understand that it is a class society. That is, a wealthy minority class rules, and a majority subordinate class is exploited. The profits that the capitalist ruling class so fiercely covet do not fall from the sky. They come from exploiting the labour of the working class majority – millions of workers in Canada, and billions globally. Capitalists profits grow the more they hold down our wages, the more they force us to work harder and perform more unpaid overtime. They can do all this better if they are able to weaken our trade unions, organisations that try to improve the wages and conditions of workers. The Harper government with a majority legislates back to work any group who challenge this – like the postal workers. The control that the ruling class has over the economy gives them power over us. Work under capitalism is experienced as a dictatorship. We do not elect our employers or managers – no media worker voted to have Murdoch own much of the world’s press. Instead the bosses get to select from among us who will even get to have a livelihood and who will suffer unemployment. The capitalists make all the decisions about what will be produced, where and how it will be produced. The social and economic power that the capitalists have over the majority of workers is then translated into political power for the rich. Most of the world’s population do not even have the political rights afforded by liberal democracies. Two examples are China, the fast-growing capitalist power where most of the clothes and electronic goods we own are made on behalf of large corporations, and Egypt where the vile Mubarak dictatorship ruled for 30 years with the support of Western interests and a super-rich local elite. It would be absurd, however, to say that the so-called liberal democracies like the US and Canada are governed by the democratic wishes of the majority. Governments the world over are committed to the profit-driven logic of capitalism. Governments seek to ensure that those with the power to make or withhold investments are kept satisfied. The entire Obama administration puts paid to the myth of capitalist democracy. People voted for change, but have gotten more unemployment, more housing evictions, cuts to Medicaid, more troops to Afghanistan and an extension of Bush’s tax cuts to the richest one per cent of Americans. 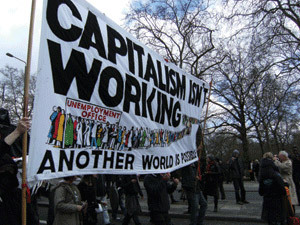 Given what capitalism means for the world, we should be proud to oppose this order. Socialists stand for the mass of working people taking control of the schools, hospitals, factories, mines and offices in which we work, and reorganising the economy to meet human need. It has been true for decades that modern society has the technological and productive capacity to provide everyone with food, shelter, healthcare, clean electricity, clean water, education and all of rest of life’s wants and needs. Just imagine how productive society could be if we stopped spending such vast sums on war and on advertising, and involved everyone capable of working in the work process, rather than condemning large minorities of the population to unemployment. This type of society, that we call socialism, has nothing in common with the state capitalist regimes that existed in Stalin’s Russia, Mao’s China, or in Vietnam today. These are vile class societies just like in West where workers are dictated to and exploited by a minority. The capitalist class tries to dragoon people into accepting their system by asserting that there is no alternative. They pretend that we need them and their schemes for profit. But we do not need them, they need us. All of the useful labour in society is conducted by workers – all of the agriculture and manufacturing, the construction of buildings and roads, electricity production, transport and so on. None of this is possible without workers. The bosses on the other hand do none of this activity, they simply profit from the labour of others. Here lies the great weakness of the ruling class. Their system relies on our labour. This is why workers’ strikes are the most powerful weapon for fighting the ruling class. Strikes have been essential parts of winning equal pay for women, in ending apartheid, in winning the eight-hour day and other gains. But more than this, when working people defy the orders of the ruling class by taking mass collective action in the workplaces and on the streets, we can break even the most tyrannical of regimes. This fact has been repeatedly proven from Russia in 1917 to Egypt and Tunisia in 2011. And it is when workers set up their own democratic institutions and move to replace the old state machine that we can set about reorganising society for everyone’s benefit. Being a socialist is about more than acknowledging that the world could be better. It is certainly not about sitting around and waiting for a revolution. Socialists are always the ones trying to campaign against injustice. We demonstrate in solidarity with the oppressed people of Palestine or the innocent refugees cruelly locked up in Canadian detention centres, organise in our unions to improve working conditions and get involved in struggles for a better world whenever we can. If there were more of us, these struggles would be all the more effective. We think that the system to today is unacceptable in so many ways – and it is just as unacceptable to sit back and do nothing. Mainstream politics under capitalism is a cesspool. Politicians are incapable of doing anything but cutting social spending, cutting corporate taxes, and then blaming refugees for somehow “threatening our way of life”. We need more organised socialists today to stand up to these political lackeys of the rich and to begin organising more resistance to their system.